Like an old mate nearing the end of a long, colourful life, Carisbrook is set for a fitting Test send-off on Saturday. The All Blacks coaches and their team are leading the queue to the wake as they prepare for their 37th and final Test in the ground's 102-year history, remarkably against old foes Wales for the first time. "It's a special ground in New Zealand... one of the iconic grounds. It should be buried in the appropriate way," coach Graham Henry said. His assistant Wayne Smith concurred. "It's a fine old gentleman of New Zealand rugby, Carisbrook, and hopefully we can do it justice." Still, amid the misty-eyed memories, the All Blacks' brains trust remain irked that they haven't done their old mate justice in recent times. 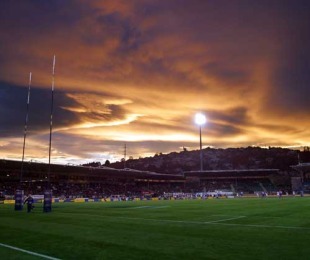 Of New Zealand's four "iconic" Test venues; Carisbrook remains the All Blacks' winningest. Played 36, won 30, for an 83 percent success rate. But, with a streak of 20 straight wins, Auckland's Eden Park is catching up fast (52 from 64, 81.25 percent) with the All Blacks having lost their previous two Tests at the House of Pain. "We've sort of stuffed up the record, haven't we," said Henry as he mused over the 28-30 defeat to South Africa in 2008, which still clearly rankles, and last year's forgettable season-opening 22-27 loss to France. Smith added, "It hasn't been much of a fortress for us the last couple of years, unfortunately. That's got to be our aim to really put in a big one and leave it on a good note." The players loved Carisbrook, Henry said, because it was an excellent playing surface and the crowd were close to the action, "very vocal, and very supportive". A 29,000 sellout for Saturday was guaranteed long ago. The stories have flowed this week. Henry recalled scoring a try at Carisbrook for the Union club against University in 1967 - and being miffed at the general amazement that he'd crossed the line. Then he kept wicket for Otago against Fiji whose star batsmen slayed 160 off 70 balls: "I spent most of the day watching the ball fly over the boundary." All Blacks assistant Steve Hansen grew up in nearby Mosgiel, as did Brad Thorn, and played at The Brook as a youngster, while Smith played in the arctic 1983 Test against the Lions when Allan Hewson and Stu Wilson added woollen fingerless gloves to the All Blacks' gear list. "In the leadup we trained in snow, and it was the first time technology came into the game because we went from wearing rubbish bags to keep warm, to neoprene sleeveless tops which was fantastic," Smith said. But time moves on. The old ground is showing its age, the concrete terraces are weary and even the craggy rugby types who filed in there to watch All Blacks training on a crisp Dunedin morning this week would agree. A new construction is taking shape on the eastern skyline by the harbour, just down from the University of Otago campus, and is on schedule to open in August next year in time for the World Cup. 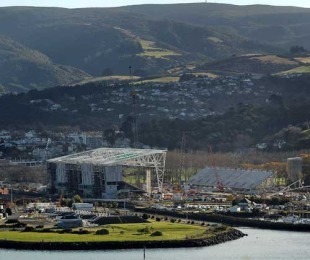 At a cost of NZ$198.3 million, the new 30,000-capacity stadium will be New Zealand's first rugby ground with a roof. And, much as the All Blacks will miss their old mate, they will welcome a new one with relish. "It's pretty exciting... hopefully we can open it. It would be great, wouldn't it," Smith said, in the hope a Tri-Nations test can perhaps be snuck in before the World Cup. Henry is also welcoming the new arrival, with the roof a big selling point as he looks for protection from the elements to assist his team's open, running style. "Carisbrook is an iconic ground and it's a pity it's closing, but you have to move on and we're going to have our first indoor stadium which will be great for rugby, great for sport and great for the south."